Tape automatically stops at desired distance when extracted. Quick-release button rewinds tape into case. 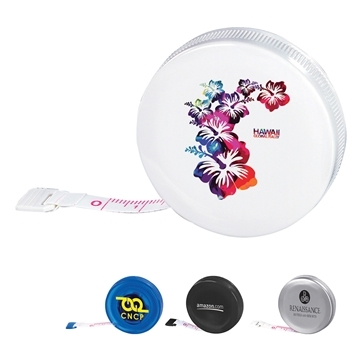 Material: Plastic case with polyester tape measure. If you're looking for a compact, easy-to-use, measuring tape these are it! Perfect size for the glove box, purse, or pocket. Happy with this order. Just as expected and quick! I will use anypromo again. I would encourage you to look at them for use! Very pleased with the cloth measuring tapes. This is our second order with AnyPromo, and we will continue to order from them.